The Palermo 2 + 2 Chest is a wonderful addition that will introduce a touch of glamour to your bedroom or master suite. This stunning chest of drawers works beautifully in the bedroom, providing essential storage in the form of 2 smaller drawers on top, with 2 larger drawers on the bottom. 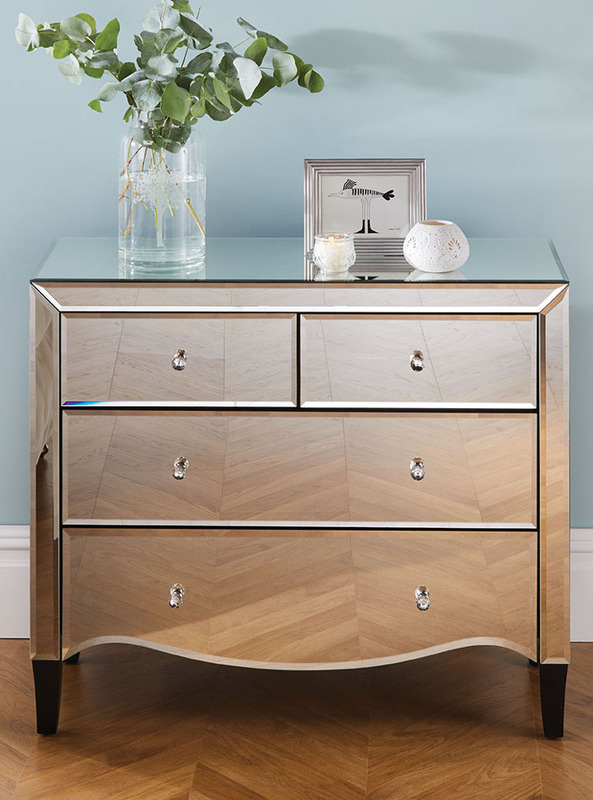 The entire Palermo 2 + 2 Chest is covered in a mirrored finish creating an elegant look that's fit for Hollywood. The Palermo 2 + 2 Chest is one of the pieces of stunning bedroom furniture available from the Palermo range. The design is inspired by the classics, but the straighter lines of the piece helps to bring it into the 21st Century. It's stylish, modern and practical; whilst keeping the romance and elegance from days-gone-by with the use of a curved lower drawer panel. The mirrored finish is completed with bevelled edges and mock crystal handles. Store your belongings away in the 4 drawers of the Palermo 2 + 2 Chest. The top two drawers are the same size, perfect for storing intimates, socks and accessories. You could also use the chest to store away make up and beauty creams. The lower drawers are larger, offering plenty of space for other items of clothing such as jumpers and cardigans. There's lots of room and opportunity for you to create space elsewhere in the home. Quality materials and finishing touches are used in the creation of this stunning chest of drawers for the bedroom. The Palermo 2 + 2 Chest is pre-assembled for your convenience. Choose the Palermo 2 + 2 Chest alongside some other stunning pieces of bedroom furniture that make up the complete Palermo Mirrored Bedroom Furniture Collection.